As I sit writing this page, the madness that is the January transfer window has just come to an end. Brian Swanson of Sky Sports News can recharge his 5 mobile phones (that never seem to ring), the guy doing the live BBC text updates can stop trying to make people believe that there have been sightings of Messi in Macclesfield, Newcastle United can begin working out exactly who is going to play up front for them and clubs up and down the country can stick their fax machines back in the cupboard until next deadline day. I’m sure even the most optimistic of Watford fans won’t have expected any big name signings, instead following the day’s events with a mixture of nerves and apprehension, hoping and praying that none of Watford’s top performers left Vicarage Road for the promise of riches and the place on a Premier League bench. I on the other hand am a bit different. Whilst I certainly didn’t want to see Danny Graham sign for West Ham or Lloyd shipped off to Barcelona, my main concern was who we may bring in. I’m scared of new signings. I know it sounds strange, after all, most successful teams are built on the back of key signings – players who strengthen and bolster the squad. No Watford fan could argue how important the signings of Barnes, Coton, Marlon King et al have been to our recent history. The problem is though, we’ve signed some stinkers. For every McClelland there was a Morallee; for every Rostron or Rice there was a Rinaldi or Rumble. Some of these dreadful signings took place during my formative years and three of them have scarred me for life. 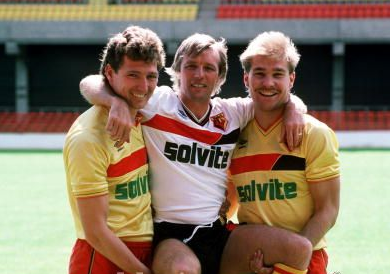 Trevor Senior signed for Watford from Reading in 1987 too, but he was of different stock to Hill. Senior had banged in over 100 goals for the Elm Park outfit in just over 150 games. He sounded good and I was excited he was a Hornet. If I told you that the terrace chant for our Trevor was ‘Ee-Aww, Ee-Aww, Senior must score’ you’ll get a vague idea as to how his career panned out. We flogged him to Middlesbrough after 24 appearances and a single goal. We’d signed another dud. I was now suspicious. We were parting with players like John Barnes, David James and Mark Falco and replacing them with players who I wouldn’t pick for my playground kick about. Despite this early observation, our transfer policy must have improved somewhat as I don’t remember us purchasing anyone quite as bad as those two. Or at least I didn’t until we signed goalkeeper Perry Digweed. Digweed looked like someone’s Dad, and played like someone’s Grandad. I would have felt sorry for him if his bungling performances didn’t make me so angry. Luckily for my health and my football club, he retired (20 years too late) in 1995. These three horrors have stuck with me and are clearly responsible for my immediate and irrational concern upon the announcement of a new arrival. Luckily, with Graham Taylor and Malky steering the ship, the likes of Hill, Senior and Digweed are a gruesome thing of the past. You still won’t see me getting excited about transfer deadline day. though.